Give Yourself Grace. | The girl who loved to write about life. Last night, I placed my first order with Shipt (a grocery delivery service). I was so excited to not have to do the dreaded post-vacation grocery shopping and instead have someone deliver them straight to my door. What a time to be alive. Sadly, it was not a good first experience. My delivery was an hour past than the end of the window I gave, and even though I live right down the street from Publix, there was an hour between the driver texting me that she was on her way and actually getting here. I was tired and hungry and just irriated. After she delivered the groceries, Chris said, "I feel sorry for her. She feels really bad for messing up." Side note: I wish that I could say I had the same immediate reaction, but alas-tired and hungry, friends. Tired and hungry. I was still annoyed, but as the night went on (or maybe just once I ate dinner), my resolve to leave a bad review and mark her as late started softening. I went in the app and tipped her anyway. Because I thought, everybody has bad days and why not make her's a little better instead of worse? Thinking about that this morning, all I can think is this: Why don't we treat ourselves this way? Here's this woman who I will probably never see again, who did a bad job and gave a bunch of (seemingly not very real) excuses and then laughed about it, and it took me all of thirty minutes to just get over it and have grace on the situation. But I know that when we mess up ourselves, we rarely extend the same kindness. Why don't we give ourselves grace? There are a lot of answers to that, I'm sure. We have higher expectations of ourselves. We want to be better. We were taught to strive for perfection, or no one taught us to be kind to ourselves. We think mistakes make us look unprofessional, or we've trained our brains to view every mistake as a huge setback. Whatever the answer is, whatever the reason we don't give ourselves grace as easily as we extend it to others, we need to get over it. 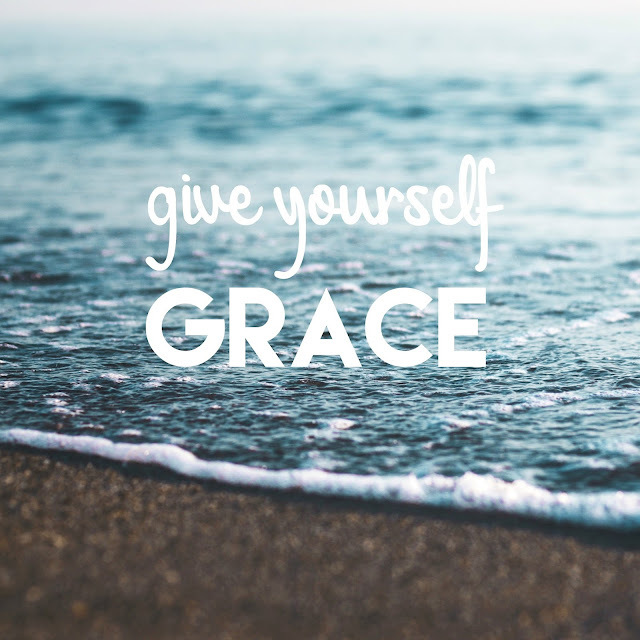 Because we all need a little grace every now and then, especially from ourselves. If we were meeting for coffee, and you were 15 minutes late, I would get over it. Sure, I'd be annoyed, but I'd get over it quickly, because we're friends and because grace. If you didn't respond to my email in time, same. If you told me you were going on a diet and a few days later I saw you at McDonald's, I can promise you my first thought wouldn't be, What a failure. It would be, She's human and homegirl needed a cheeseburger. Because you're my friend, and because grace. So next time I'm running late or delayed in responding to an email or I break my diet or make any other hey-I'm-human-mistake, I'm going to try to offer myself the same kindness. Because I want to be my own friend, and because grace.